Review of Beth A. Griech-Polelle, Anti-Semitism and the Holocaust: Language, Rhetoric and the Traditions of Hatred (New York: Bloomsbury, 2017). 284 pp. ISBN: 9781472586919. Beth A. Griech-Polelle’s book enters the market of Holocaust history as a thoroughly accessible and carefully constructed overview of the Shoah, beginning quite properly in the long history of antisemitism that lay behind the mass murder perpetrated by the Nazis and their collaborators. The author states from the outset that she is interested in “the theme of the power of language and how language and rhetoric can result in deadly actions” (1). Drawing on the work of the French political scientist Jacques Semelin, Griech-Polelle notes that a society’s ideological concerns around “identity, purity, and security” can be impacted by “destructive legends, myths, and stereotypes” that generate caricatures which create fears that “enemy outsiders” will “defile, pollute, and destroy … us” (1). In like manner, she uses Thomas Kühne’s work on persecution as community-building and Saul Friedländer’s notion of redemptive antisemitism to argue that “language and rhetoric influenced the construction of ‘the Jew’ as eternal enemy” and that “language led to the violence and annihilation of European Jewry in the Holocaust” (2). Anyone familiar with Alon Confino’s insightful book A World Without Jews: The Nazi Imagination from Persecution to Genocide (New Haven: Yale University Press, 2015) will recognize Griech-Polelle’s approach and be reminded of the ways in which language contributed to the creation of a culture—a social imaginary, to invoke Charles Taylor’s term—that made possible the Nazi persecution of the Jews and, ultimately, the Holocaust. Griech-Polelle begins with the rise of religious antisemitism—rooted in the concept of Jews as “Christ-killers’’—in the biblical accounts of Jesus’ arrest, death, and resurrection. With the emergence of Christianity came the belief that the Early Church was the “New Israel” which replaced the Jews as God’s chosen people (10-11). Tracing the loss of Jewish rights in the late Roman Empire, the author shows how the Codex Theodosianus began to impose restrictions on Jews and to generate the segregating language that would shape the medieval era. Through the period of the crusades and on into the Middle Ages, Griech-Polelle explains important incidents in the history of Jewish persecution, but beyond that, she endeavours to outline the way a particular kind of antisemitic language emerged in, for example, tropes like the Wandering Jew or the blood libel. A short section on Thomas Aquinas shows how he built on Augustine’s notion of the preservation of the Jews as a witness to the truth of both the Hebrew scriptures and the Christian gospels, adding that the Jews were people with souls that needed to be saved. “Somehow, Jews were to be converted voluntarily—despite the persecutions and horrendous depictions of Jews as being in league with the devil, desecrating the Host, and reenacting the crucifixion of Jesus” (20). This chapter on the history of religious antisemitism continues with the medieval expulsions of Jews from various European countries and follows the story through the Renaissance and Reformation, the emergence of a substantial Jewish community in Poland, and the impact of the Enlightenment, French Revolution, modern nationalism, and post-1848 reactionary politics. It closes with the persecution faced by Jews in Tsarist Russia. I’ve focused closely on this opening chapter (chapter 2 in the book, since the Introduction is chapter 1) to indicate how Griech-Polelle—a scholar both of German Catholicism in the Third Reich and of the Holocaust—handles this important topic of the Christian antisemitic foundation upon which later antisemitisms and (in the end) the Holocaust itself rested. A third chapter follows the story of how cultural and especially political antisemitism developed from the nineteenth century through the First World War and the Weimar era in Germany. Key concepts are the coining of the term antisemitism itself, the notion of “scientific” antisemitism, and “the Jew” as the outsider. What becomes clear is that antisemitism was a tool used by European political parties to spur the growth of nationalism within European mass society. 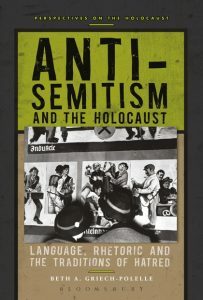 Other chapters cover the topics one would expect in an introduction to the history of the Holocaust, though in ways that enable Griech-Polelle to highlight her theme of the role of antisemitic language and rhetoric. Chapter four includes everything from the rise of Hitler and the National Socialist German Workers’ Party to Hitler’s views on Jews, the seizure of power and early phase of Nazi rule, and Nazi Jewish policy through 1935. Chapter five is called “Turning Points,” and argues that although Jewish life had been deteriorating from 1933 onwards, the period from 1936-1938 was marked by exclusionary policies which reinforced “the notion that to create the Volksgemeinschaft [national community], anti-Jewish actions were required” (111). Emigration, the growing refugee crisis, expulsion, the Kristallnacht Pogrom, and the beginning of the Second World War are all surveyed here. Chapters six to eight cover the heart of the Holocaust, from “Resettlements, Deportations, and Ghettos” to “Einsatzgruppen, Executions, and ‘Evacuations’ to the East,” to “The Final Solution,” with its emphasis on the death camps in Poland. Throughout, Griech-Polelle treats a host of subtopics briefly but conscientiously, meaning that her history of both antisemitism and the Holocaust comes to only 232 pages of nicely formatted text, making it easy to read. Two features of the book are worthy of note. First, throughout her work, Griech-Polelle employs material from various volumes of the important new series Documenting Life and Destruction: Holocaust Sources in Context, sponsored by the United States Holocaust Memorial Museum (Series Editor: Jürgen Matthäus), and in particular the five volumes entitled Jewish Responses to Persecution. The result is that she is able to present the history of antisemitism and the Holocaust from multiple perspectives, incorporating the experiences of Jewish victims along with those of Nazi perpetrators. For instance, in her description of the opening phase of Nazi antisemitic policy, she recounts the reflections of Mally Dienemann, whose diary describes the “unvarying … fate” of the Jews: “now we are [supposedly] harming Germany with fairy tales about atrocities, while in the Middle Ages it was we who were supposed to have poisoned wells, etc…. Could people really do this to each other?” (89, editorial insertion and ellipsis in the original). Likewise, during her account of the Kristallnacht Pogrom, Griech-Polelle uses the testimony of Margaret Czellitzer, whose home was invaded, radio broken, china smashed, beds overturned, mattresses ruined, and valuables stolen (124). In this sense, Griech-Polelle’s introduction to the Holocaust reflects current best practices in the field of Holocaust Studies, which attempt to balance perpetrator accounts with victim voices. Second, at the close of each chapter, the author includes a short section entitled “For your consideration,” in which she combines short primary source texts with reflection questions. For instance, in chapter 2 on religious antisemitism, she offers biblical texts from Matthew 27 and John 8 and excerpts from Martin Luther’s “Concerning the Jews and Their Lies” (1543). On the gospel texts, questions revolve around the descriptions of Jews, their role in the sentencing of Jesus, the naming of particular groups of Jews, and the link between these depictions and the rise of the myth of deicide. With respect to the Luther text, questions involve Luther’s picture of the Jews, his use of medieval prejudices, and the potential influence his writings might have had. These texts and questions at the close of each chapter would work well for undergraduate classroom discussions or reflection assignments. Rooted in the history of antisemitism, written in accessible prose which encompasses multiple perspectives on the events of the Holocaust, accompanied by primary texts, reflection questions, suggestions for further reading, and a helpful glossary, Griech-Polelle’s Anti-Semitism and the Holocaust will serve uninitiated laypeople and undergraduate students as a helpful introduction to the events of the Holocaust and the discourse of antisemitism which prepared the way for the annihilation of the Jews.